I’m so excited about this post. I really want to attend as it would be my first ever. 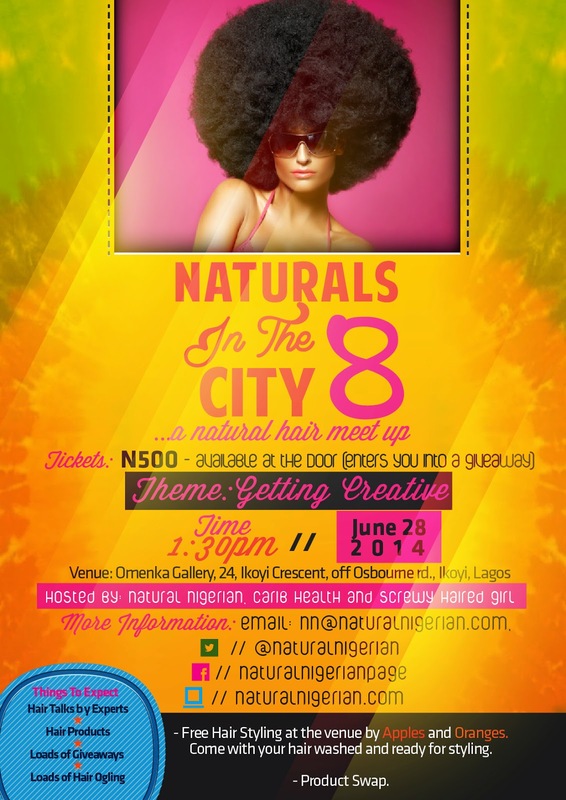 So naturals and natural hair lovers get ready for the ‘Naturals In the City 8’ set to hold in less than two weeks in Lagos. Anyone can attend the Meet up, whether you are natural or not. Aweni Organics, Accessories by Didi, Ajali, Nazuri Curls, Kalos Health) would be available at the meet-up and you would be able to purchase natural products you love. Lots of giveaways too. There would be product swap. You will also get to have your hair made for free by Apples and Oranges. Oh well, let's see sha. Oh, nice! Hadn't heard about this one, will definitely be there. Any clue how long it will last?